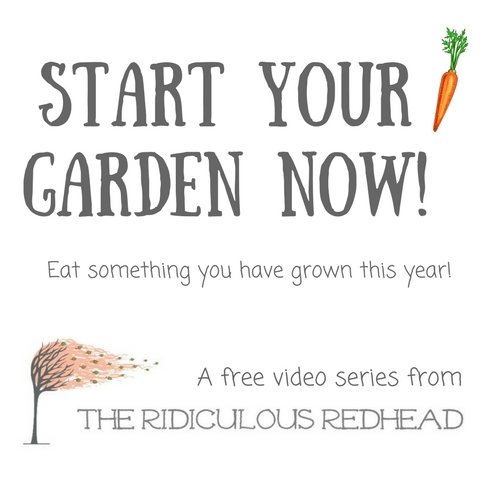 The Ridiculous Redhead > Garden > It’s seed planting time again! The holidays are over. It’s been snowing every other day for weeks. The walls are starting to close in. Summer seems so far away. But spring is not so very far away. February is one of my favorite times of the year. After the fall clean up and the holidays, I can’t wait to get back to working in my garden again. 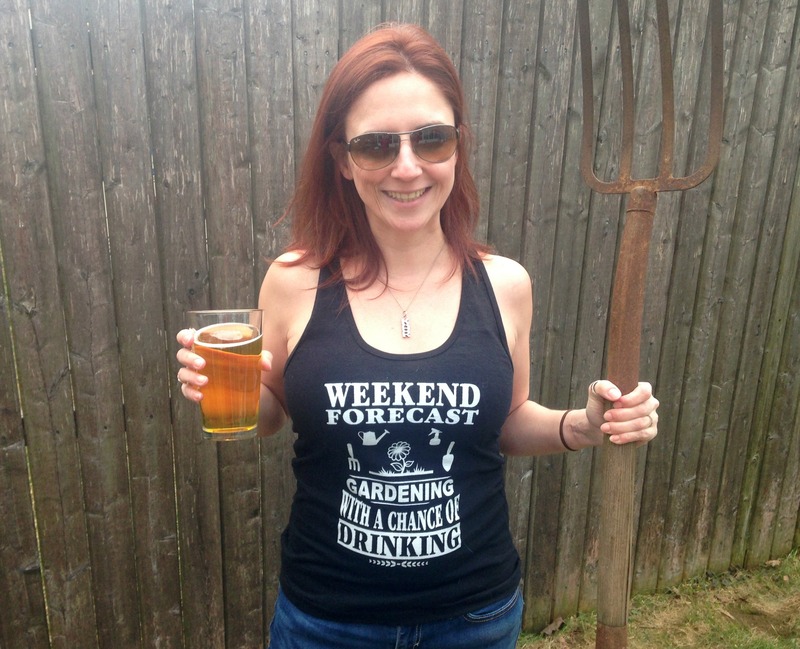 True, it is currently covered in snow but we can start seeds! We are in Zone 7, so in January I spend a lot of time driving TB crazy with all the garden planning. I flip through seed catalogs and online looking at all the pretty pictures trying to figure out what we are going to grow. Did I mention I drive TB crazy? I have a habit of annexing more garden space every year. We started with 2 garden beds that kept me happy. Then we built the bed for the asparagus. Last year the tomatoes sprang up in a side garden that used to have dune grasses and I let them stay since the dune grass hadn’t come back. So this year I figured since it would cost a lot more money to buy large plants to fill that space, I could instead use it for vegetables. Veggies are only a few dollars for a seed pack. This argument seemed to work for TB and I have nicely taken it over in my veggie plans. My next plan is to get some edibles in the front yard. This of course scares TB to no end in the mind of “if you give her an inch…” He knows that if I had my way we would have very little grass and there would be hedges of artichokes. Our front yard gets a lot of sun so it would be perfect for some veggies. I am researching different ways to make it a beautiful edible garden where you hardly notice there are veggies in with the beautiful flowers. But marriage is about knowing how to compromise. So I am starting slow with just a border of alpine strawberries. They have pretty flowers, don’t send out runners to make a mess and have tiny fruit. Maybe I can sneak in some herbs too when no one is looking. 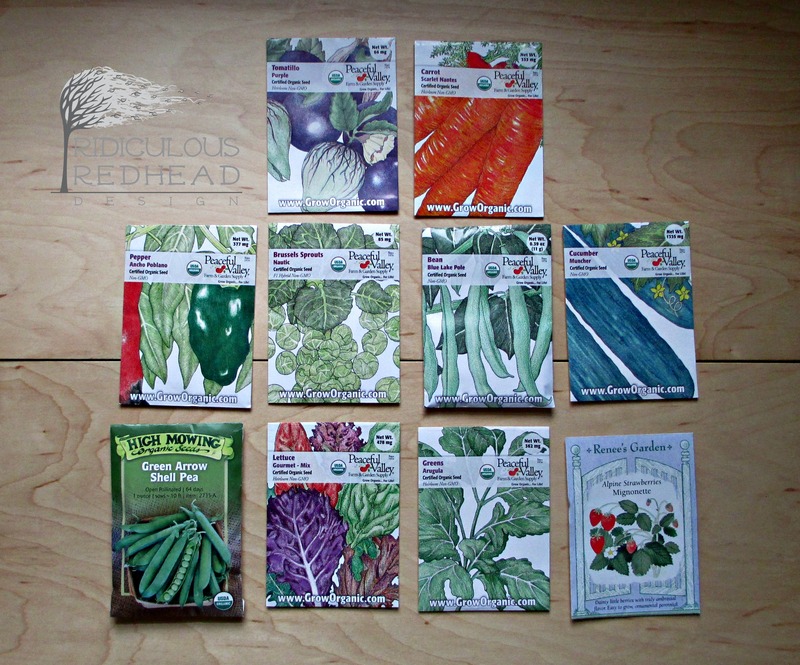 So here are the veggie seeds I am starting with. Tomatillos, purple – I had some tomatillos from a friend last year but they were planted too late and I only got a few. I figured I would start them early this year and the purple color seemed fun. Carrots, Scarlet Nantes – These are the same kind I grew last year and loved. They are sweet and blunt shaped on the ends. Pepper, Ancho – I don’t eat peppers so this was TB’s pick. We have done bell peppers in the past so we are trying something new. Brussels Sprouts, Nautic – Growing up I was scared of brussels but have become a huge fan. When you don’t boil the crap out of them they are delicious. Try this recipe at Add A Pinch, it’s awesome. Also, the way they grow is so cool; they look like tiny palm trees. Brussels do best in the fall when the frost hits them so I will plants these in late summer after the garlic and shallots are done. This is the one I am most excited for. Beans, Blue Lake Pole – Last year I grew the Blue Lake Bush beans and thought they were great. It’s a classic variety of green beans. This year I am going to built a new, one panel trellis (like the cucumber frame) for each of the beans and peas and let them grow up in my new annexed garden. I thought we could use a tall plant over there since it just empty space and a gray fence. Cucumber, Muncher – There are so many varieties of cucumbers to choose from. In the description, this one mentioned it was so sweet you could eat it off the vine like an apple. I have no idea what that means but it sounded good and gave me a reason to make a choice. Shell Peas, Green Arrow – This is another vegetable that I avoided my whole life because they taste terrible after you boil the crap out of them. Last year was our first year growing peas and they were delicious. You could eat them right out of the garden. This will go on a new trellis by the green beans. Lettuce, Gourmet mix – This is a mix of red and green salad bowl, buttercrunch, lossa rossa and paris island cos romaine. It’s a new mix for us and was TB’s pick. Like with cucs, there are so many different kinds of lettuce to choose from. This gives us a few types we can try from one packet. There is always a point in the spring where we can’t possibly each all the lettuce, we bring it to every dinner party and then it’s over and I miss it. Arugula – This is always a favorite around here. We love arugula salads with steak or beets and goat cheese. It’s also one of the first things to be harvested while everything else is still cranky that it’s cold. It’s something to look forward to. Alpine Strawberries, Mignonette – These are a new fun thing to try for the year. 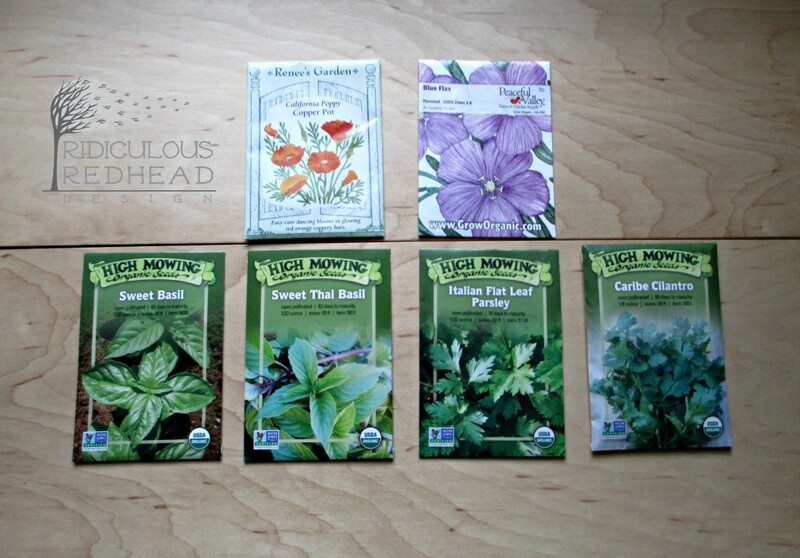 I am going to plant them as a border in the front gardens to fill in instead of annuals. I always mean to get some pretty flowers to plant but then I don’t want to spend the money and the garden is bare. These have pretty flowers and don’t take over the world. 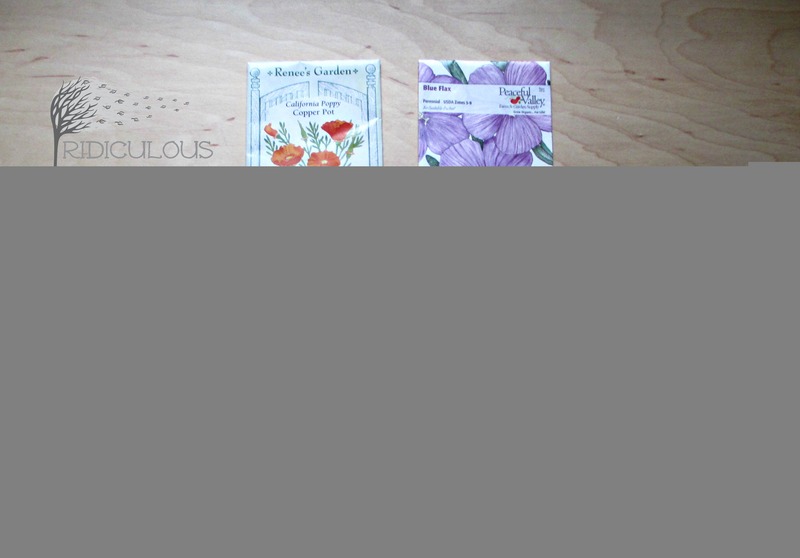 I have also picked up some herbs and flowers. We already have a rosemary bush, some thyme and tarragon going. Our parsley is still going from last summer too in our non-heated sunroom but I’m not sure I can expect it to last through until next summer. There is mint too if I haven’t killed it. Yes, I am the person who can’t grow mint. Poppies, California Copper Pot – I have never grown poppies before and I’m not really sure where I’m going to put them. Truthfully, it was a whim when I bought the garlic in the fall. I have terrible luck starting flowers from seeds so I haven’t fit them into my garden plan yet. If they actually grow, I will find a spot. Blue Flax – These were bought on a whim with the poppies. It was fall and gray and I was craving a pop of color. These are a perennial so hopefully I can get these going and have some color with out the work next year. Basil, Sweet – This is a huge favorite in our garden and we grow it every year. If you are at our house for dinner in summer, there is a good shot fresh basil will be on something. Parsley, Italian flat leaf – This is the classic parsley everyone cooks with. I expected for last year’s to be dead by now so I bought more. I can always add some more seed to make sure we have a good harvest. Cilantro, Caribe – I really like cilantro but it’s a pain in the tush to grow. Just as the leaves are getting to the point where you think you can get a harvest, it goes to seed! And you are out of luck if you don’t need cilantro on the one day it was ready. This variety is supposed to be bolt resistant so we shall see. We will need this after all for the salsa I will make from the tomatillos! You may notice that all our seeds are organic. This is important to us for a few reasons. First, it’s an economical way to feed my family without worrying what our food was sprayed with. Second, organic gardening is better for the whole ecosystem. Every time you buy organic, that’s a little bit less pesticide that was sprayed somewhere that damages soil and kills animals and good insects. And a little more money that goes into the organic farmer’s pocket to continue to grow and plant more, without pesticides. This year I am going to winter sow my seeds. I thought it was best to have the seeds far away from the tiny human and dog who are so happy to “help” mommy with her chores. I have already prepared the containers and will show you all the details of the seed planting as soon as I get out of this house to get potting soil. Between this cold and the snow it doesn’t look good.